- Increase employee effectiveness and creativity through integrated messaging, collaboration, and office productivity applications. - Reduce overall cost of ownership by deploying integrated offering with office productivity suite included at no additional charge. - Protect IT infrastructure with a layered security model that reaches from server to individual field in a document. - Increase mobile and offline productivity from secure, reliable replication. - Increase individual responsiveness through customizable interface. - Reduce application development and deployment costs through quick creation application component mash ups. - Minimize downtime with high availability and simplified administration tools. 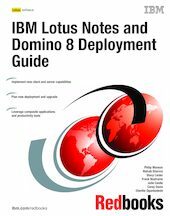 This IBM Redbooks® publication provides you with information about the new enhancements and features of Lotus Notes and Domino 8 and provides guidelines or directions on how to implement or utilize these. It also provides you with an approach to planning and deploying Lotus Notes and Domino 8 in new and existing environments.